It's been no secret that I've been learning color theory in my art journals. You see, I didn't really pay attention to it until I was taking a tour of the Phoenix Art Museum with Dina and listened to her speak about color usage by the great artists and their contemporaries; she'd point out the importance of the red chair or diary in a painting, about how colors work harmoniously together, and her words swirled around me, my heart aching to create art that spoke on so many levels. 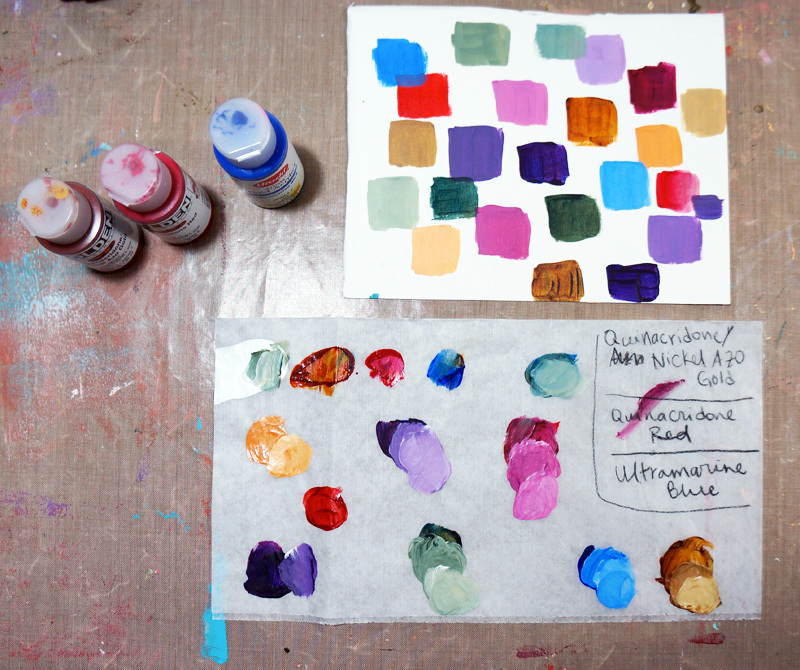 Even if you're just playing in your art journal, wouldn't it be wonderful to just know which colors would work together? It would take a lot of the guess work out of painting -- you could then focus on content and message and collage, rather than hoping the colors you chose would look awesome together. At least that's my thinking! I've been mixing colors for years, but have never stretched myself as far as when I did this exercise in Mary Beth Shaw's book, Flavor for Mixed Media. 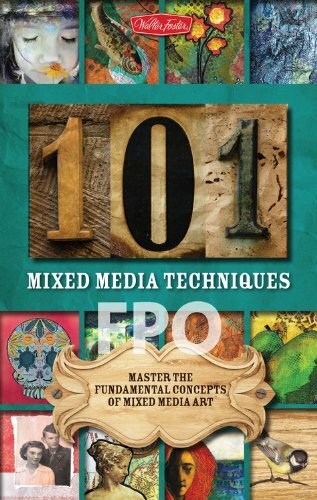 This book, while like many of our modern how-to books, surprised me with the variety of techniques and exercises within; each is inspired by the work of other artists, meaning you get lots of interviews and insights to our favorite art-makers out there! Add to that recipes for yummy food, and you have a wholly unique book on your hands. 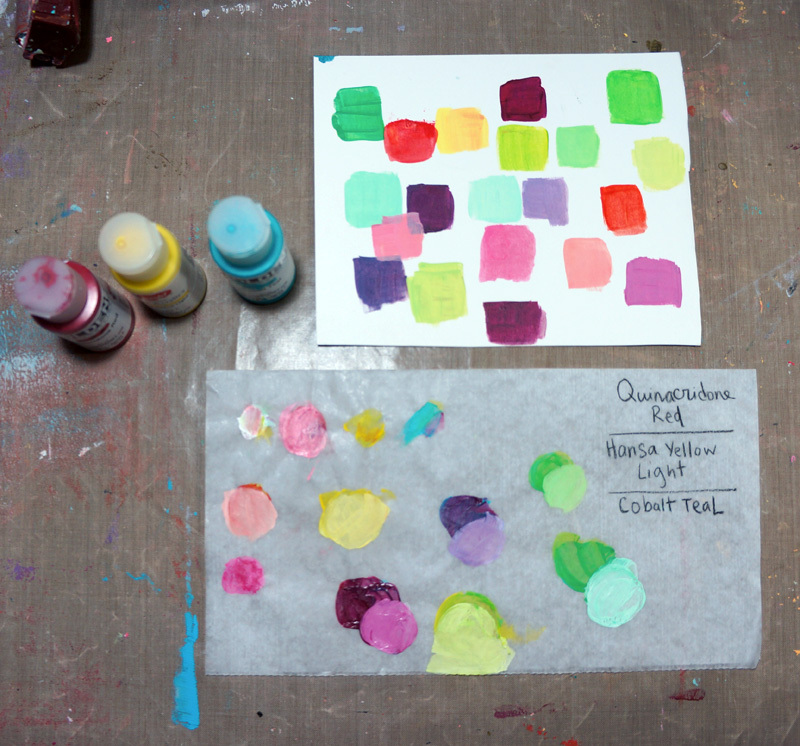 In this exercise, Mary Beth encourages you to get to know your colors better. By choosing three colors: a red, yellow, and blue (plus white), you then mix two of them together in all the ratios you can think of...and there are a LOT of colors you can create with just three shades of the basic colors! I thought I'd be doing a couple mixtures, but each just went deeper and deeper as I played around. Not only do you discover new colors, but you suddenly have a whole palette of harmonious colors you know will go together, all from three little bottles. I can't wait to make journal pages from these experimental pages & colors! I really encourage you to give this a try and record your results. I mixed my colors on deli paper, as Mary Beth does in the exercise, recording the colors I used with a Stabilo All pencil. I worked on watercolor paper, making little squares with an angled brush (but you can make circles or rectangles!) . You'll really stretch your own understanding of color and mixing, and the whole process is so calming, it's a perfect warm-up exercise to a rewarding session with your art journal! You can even glue the results in! This is my earthy palette, and the first I tried. Your yellow doesn't need to be bright yellow, but can be a shade. Look at that dreamy purple over there on the right! I was really astounded by the range of colors created from these primaries. The Nickel Azo gold may not seem like a yellow, but it is...gold! I wanted to show you my mistake batch....I forgot a yellow, and threw in a green instead, and yeah....it doesn't work really well! Oops! This, by far, was my absolute favorite of the four....just looking at the mixture sheet makes me happy! Expect to see a journal page covered in these colors real soon over on my Instagram account! Mmm! Mint! And lime green! And a warm pink! Yummy! Also, I wanted to let you know I've created a little vlog YouTube channel called JournalGirlStudio. I really love making those short check-in videos from my studio (I've even made little ones and sent them to friends!) and thought I'd throw 'em up on YouTube. That way, you can just see what I'm up to whenever you want without having to be on Instagram or Facebook. They'll all be made from my iPhone....so let's see how this goes! Art Doodle Love Blog Hop! Oh! A new book is always a gift, but one created by a friend is one wrapped in beautiful paper and dashed with glitter. 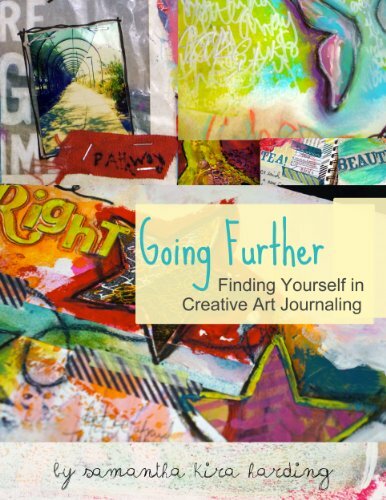 Dawn Sokol has really outdone herself with this, her third art journal book -- created just for YOU -- by aiming not for young girls and boys, but YOU. Yes, YOU! I know if you're reading this, you're going to LOVE her new book, Art Doodle Love. I'm so excited to share some pages from it! I first saw it while having coffee with my darling friend about a month ago, and couldn't wait to get inside it! I just adore her backgrounds and colors (which attracted me to her and her art years ago! ), but what REALLY excited me was the prompts. Oh, yes....did I mention it's full of prompts? The first chapter is all about loosening you up! When I approached the scribble page, I was like, "Oh, I can scribble!" But it's HARD, isn't it? To just let go and make random marks across the page? I think we all scribble to a point, and then move on. Having a spread telling me to scribble and fill the whole thing was actually hard, until I just started having fun! I got a few odd looks from the sounds of my paint pens and markers jumping around on the page, but I was grinning the whole time! There are a bunch of fun activities inside to prime the pump, like the page of drips and drops; I saw a trapeze artist when I saw one, and just doodled her. This book is full of thick, creamy paper, by the way, so your pen just glides, and you don't have to worry about the paper buckling under your work! The prompts are amazing....look at this one! This journal REALLY gets you thinking, reflecting, and being still enough to listen to yourself. While journaling on your own is full of discovery and revelations, working through one with prompts, and ones that engage and pull you from your comfort zone, can really unlock parts of yourself you haven't engaged in years. When was the last time YOU thought about the past you? I think many of us start over in our lives, again and again, and shed those old identities. As I was working on this page, I found myself wanting to go back and talk to the old me, give her advice, help her through the battles to come. It brought me a measure of peace, knowing how far I've come. And the background already on the page made it easy to focus on the thoughts and emotions going through my head, since I could collage and doodle right away, rather than waiting for paint to dry. I found that the colors and backgrounds helped me focus down what materials I would use, and locked me into a color palette that took a lot of guesswork out of journaling! Instead of being overwhelmed by all my choices, I could grab a small collection of supplies and match things to the backgrounds. They're great to work over, and have those messy details I adore! 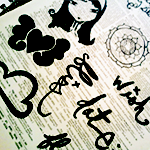 Because of the quality of the paper, I wasn't afraid to collage, paint, and doodle all over the pages. My Copic markers didn't even bleed through that much....easily thicker and nicer paper than the Moleskine sketchbook I've been playing in! And this whole book is sewn, meaning it lays flat and the pages aren't coming out any time soon. It certainly will be hanging out with my other art journals, there to pull out whenever I need to reflect, warm up, or just play. I did a lot of this stuff while watching movies on the couch, using a smaller batch of supplies. If like me you're past how-to books and are really yearning to use your journaling for self-discovery, then you can't find a better book to invest your money in. Reasonably priced, full of color and inspiration, and prompting you to really examine your life, Art Doodle Love is amazing and perfect for ya. Dawn will be running a give-away on her blog starting February 8th, so make sure to head over there to enter! And don't forget to visit the others in the blog-hop for more pages, inspiration, and peeks inside! In art journal, creativity & inspiration, Books! I know I’ve been away for a bit, but I’m back! Last week, I had a horrible flare-up of my fibromyalgia, to the point I could barely get out of bed! I spent the time watching my favorite TV shows on DVD (Chuck &, you guessed it, Fringe!) and reading in bed, which was pretty nice! It’d been a long time since I allowed myself to just be…and the relaxation therapy worked, because I felt better a few days later. And then this week, I was down with a stomach bug for 2 days! Phew! Sundays are my favorite days of the week, because I spend the time in my favorite coffee shop with my dear friend Judi. She clips coupons and I play in my journal or write stories, and we always end up wandering around the East Valley on our “grand adventures” that usually begin with me going, “Let’s go to Mesa,” and then we just see what we find! One Sunday, we found an amazing vintage thrift shop that is just perfect! They’re still working on it, but the place is magical! (It’s called The Good Store Thrift, if you’re in the area, right on Main Street) I just adored the shop, and kept talking about my paintings…and something tells me I should bring in some photos, just in case. Who knows what could happen! I love being impulsive and unpredictable on my Sundays. An idea will come to me and I’ll just go for it – and that’s what happened last Sunday. A bit of back-story: I live very close to a magnificent used/new bookshop called Changing Hands. After being in my apartment for days with my flare-up, I decided to head over there and wander around; they have amazing books and also a great gift area – it’s the kind of shop where you can find Kelly Rae Roberts, Donna Downey, and Papaya! gifts, as well as all sorts of fun things that come with an indie bookshop. When I walked in, there was a fun, crafty display for Kathy Cano-Murillo’s book signing the next day. What fantastic news! I’d always meant to grab her first book, but the desire got lost somewhere, so I decided I’d go the next day to her signing and grab a book. How fun, right? So, last Sunday, I told my friend we’d be stopping by there for the signing. Let me say this: Kathy is adorable. Adorable! She’s so animated and full of life and just sparkles. I first met her last summer at CHA where she was running a make-and-take with her wonderful craft line – and I learned the merits and joy of glitter! She just has this energy about her that made me have to grab her new book, Miss Scarlet’s School of Patternless Sewing. I finished reading it last night. Oh my goodness, darlings, you need to read this novel! First off, the women are smart – Miss Scarlet has two science degrees. Mary Theresa works in computer programming. I mean, when do we get to, as women, read novels with smart girls in them? Just because we love to craft does not mean we don’t have minds that can grasp complex ideas – have you ever tried to engineer a journal or skirt from scratch? I’d like to see some of those nay-sayers do that! Second, there’s a whole lot of heart. I wish these women really existed so I could run to Glendale and sew with them. The characters are fleshed-out, brilliant, funny, and true. I love the positive attitudes and the organic progressions of all of them as the story goes on – there’s nothing forced, and the blossoming of each woman is magical! The story is one that we, as artists and crafters, know so well: Miss Scarlet loves to sew – feels it in her blood – and decides to go for it. She creates items for an Etsy shop while working two jobs in fashion to pay the bills. She loves her family but feels they don’t support her dreams. She’ll do anything to get to that next step, to “make it.” But the moral of the story is this: don’t forget who you are in the process. Which is a very important idea to remember. Miss Scarlet has ups and downs throughout the novel that I can defiantly relate to. My own parents were exactly thrilled when I left my “normal” job to pursue art full-time, and I’ll occasionally get The Talk from them about sustainability and stability. But when you feel something in your soul, you have to go for it, and I’ve learned that it all comes from a place of love. And here’s the kicker, the ultimate sign of a good book: the end made me cry. Not sad tears, but OMG this book was wonderful and I actually feel real character resolution. Which is why I felt compelled to get up and write this blog post – because I think everyone who does an art or craft or anything because it makes their soul sing, should read this book! You’ll be inspired to not only go for it, but do it in style! Just a little more fun from the sunny desert! 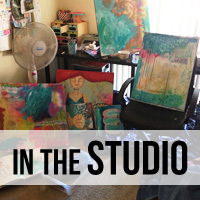 I go over Liquitex Ink!, paintings, and fun with color! I'll be putting paintings up next week. This week is for color study and play. Sometimes, your play and time isn't all about the finished product. I'm loving playing with color and thinking differently, and can't wait to try some new ideas out in my journal! This one's certainly getting filled with fun, and fast! As soon as my sewing machine arrives, I'll be putting up custom journals - both sewn and ring-bound - screenprinted fabrics, and little paintings. I cannot WAIT to get these ideas out of my head and into the real world!